I really, really enjoy taking my kids out to eat. And I’m not talking about taking them to a fast food restaurant or even Panera Bread. I’m talking regular, sit-down restaurants with waitresses and menus full of flavorful food items. 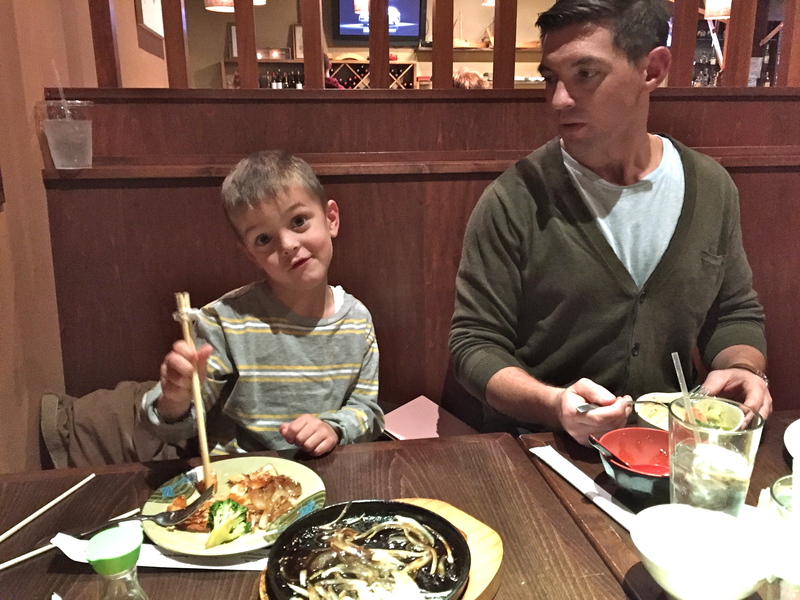 Taking my boys anywhere is always an exercise in patience, will power, and of course – humility. Patience because they don’t operate in the peaceful, quiet manner I prefer. Will power because they will do things that drive me crazy. And humility because I will be acutely aware of the other patron’s annoyance at my children’s behavior. I should stop here to say that I don’t think my kids are really any crazier than anyone else’s. It’s just that they are, well, kids. They are toddlers who are still learning the ropes and who haven’t learned to squelch impulses for the sake of common curtesy. They don’t even know what curtesy is common. Or what curtesy even is, for that matter. But one thing I’m a big believer in when it comes to kids, is that they won’t know what we don’t teach them and they won’t care about things that we care about unless we expose them to those things on a regular basis. I, for one, care about food. Like, a whole lot. I care about good quality food served in an interesting environment and I appreciate a wide rage of ethic foods and cooking styles. I know how to carry myself in public, how to order well, how to hold conversation over a meal, and how to generally enjoy myself in the company of both friends and strangers. They throw toys, they drop food. They try to eat off your plate and crawl over the table to reach items of interest. It’s kind of a disaster. But, we keep doing it. Because someday, we will walk into a restaurant and all this hard work will finally have paid off. They will sit in their seats, they will make good choices for what to eat, they will chat with us and with each other, and no food/utensils/toys will be thrown. They will not reach across the table to grab your food, nor will they reach across the table to hit their brother. They will not yell. They will not climb on the table or on top of the booth, or try to scale the decorative room divider. They may have done all those things last night, but some day, those experiences will be a distant memory. One, that I will chalk up to a quality learning experience, where my kids may not have behaved, but we all ate really, really good food that I didn’t have to prepare, in a setting that I didn’t have to clean. Plus, I’ve learned a lot from these experiences, too. I’ve learned that I can still have fun in imperfect situations. I’ve learned to not be so self conscience (I’m paying to be here juuust like everyone else!). And I’ve learned that if I can’t give my kids some grace on the things they don’t know, then that kinda just makes me an impatient, unkind mom. I don’t want that. I want to be able to go with the flow and realize that these little people come into the world knowing nothing – nada – zilch, and it’s our jobs to help them learn how to navigate life. So it’s with a smile (albeit, sometimes a forced one) that we defend our own food while trying to get them to eat their own, as we pick up toys strewn around our table and we nod politely to the old lady giving us the stink-eye two tables over. Because it may not be perfect, but hey, neither are we. So let’s just try and have fun anyways. 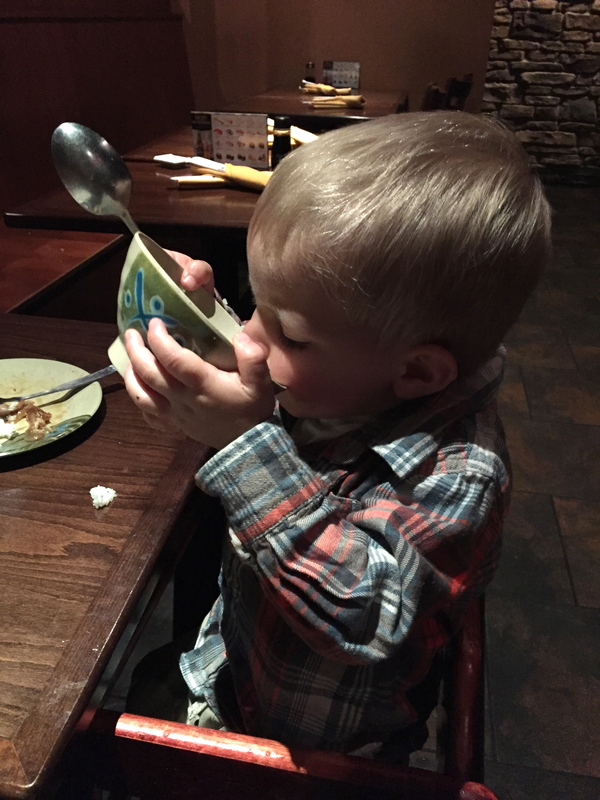 Oliver loved everything about the Japanese sushi restaurant we ate at last night. 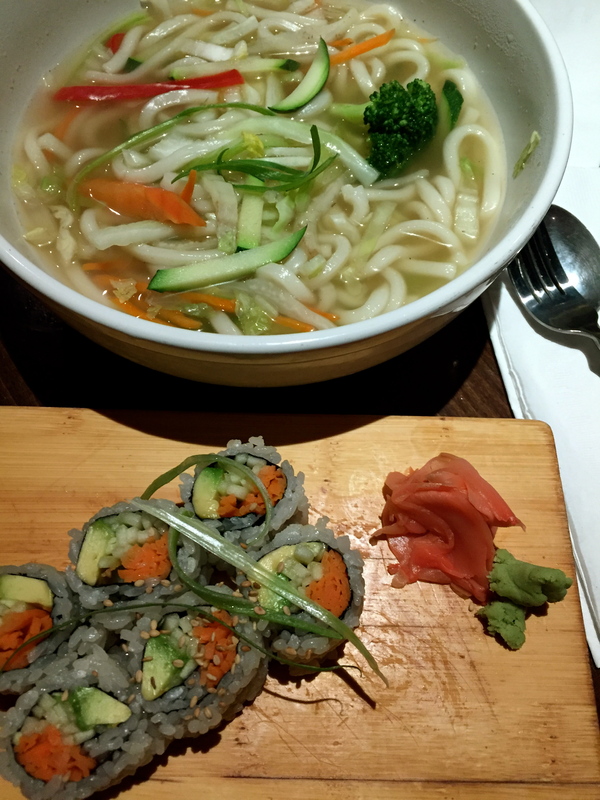 He devoured the salad with the ginger dressing (my salad, btw), ate several helpings of teriyaki chicken and rice, and then drank two bowls of miso soup (again, my soup. Geesh.). 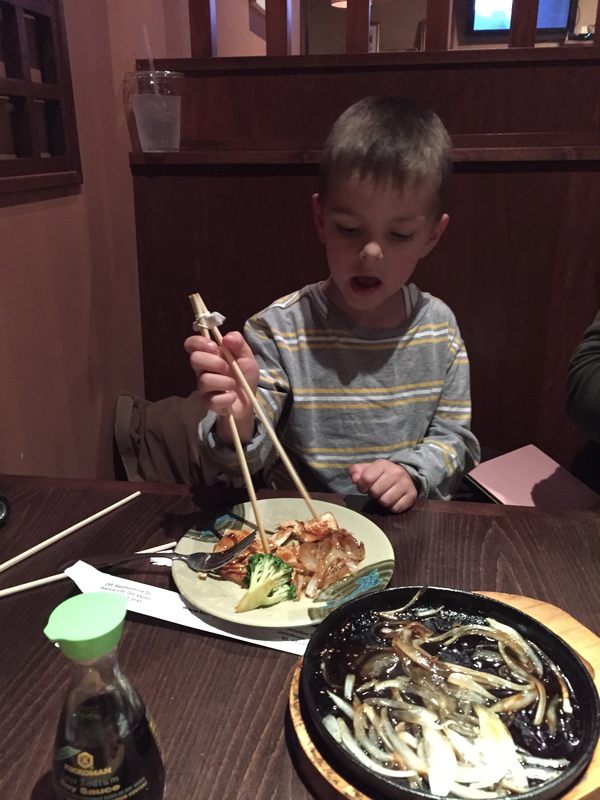 Theo’s first experience using chopsticks. I was proud of him for trying! Your right it all take’s time and it’s all trial and error as you go and hope fully each time will get better.just as people take little one’s into church instead of the nursery .It is hard sometime’s but in the end it does get better and after a while there adjust and learn this is what we do. Have a good week and hope you are feeling well.